It takes four years for a tea plant to produce tea. A tea bush can flourish for up to 80 years. Plucking - only the bud and the first two leaves are plucked as this is where the fresh sap and therefore the best flavour is found. Fermenting - the leaf now undergoes a series of complex chemical reactions that cause it to blacken. The process involves leaving the leaf in a humid environment at a constant temperature and allowing it to be oxidised by enzymes. If it is fermented too much it looses it astringent character and the leaf looks burnt , if it not fermented enough it has a bitter taste and the leaf turns a greenish brown. Green tea is unfermented which is why it is not black. Rolling – the leaves then pass through machines that roll them lengthways, breaking the cells, realising their essential oils. Drying – this is a delicate operation that stops the fermentation process at the required moment. The leaves are subjected to a dry atmosphere and high temperature that will conserve only 2% - 3% of moisture. Grading – in the final step the leaves are –placed on vibrating sieve trays that sort them by grade (whole, broken, fanning – the very small fragments of leaf remaining after processing whole and broken leaves and so on) and by size. The tea is then wrapped in paper bags or placed in wooden crates lined with aluminium foil. 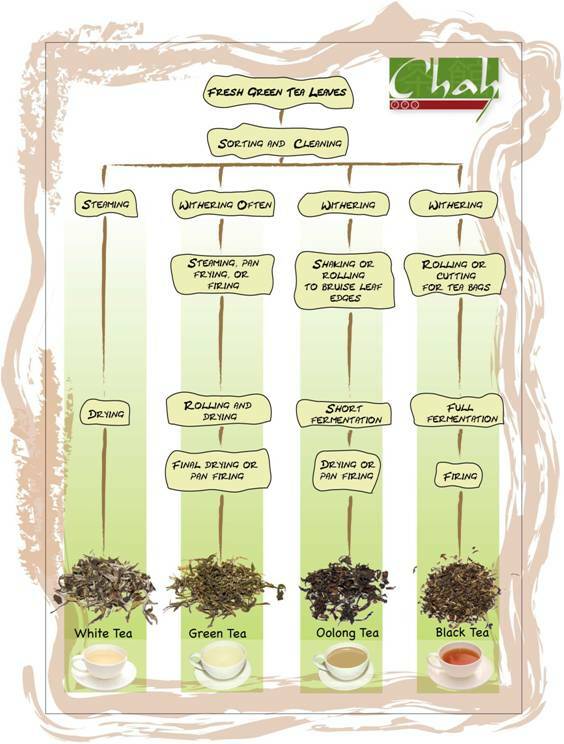 The image below show how tea is processed.